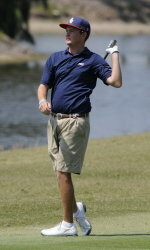 FAU Sports Informer: FAU Golf Drives to the Top! While the major sports at FAU are continuing to strive for excellence in their conference and in the nation, the FAU Men's Golf team has been rep'n the FAU letters quite well! FAU started off the season with a 16 stroke! win over Army on Feb. 19 at the Polo Club of Boca Raton. Leading the pack for the team was junior, Clint Wilhelm, who scored a 73 for the round, ending with a 1-over-par for the Equestrian Course at the Polo Club. week, when the team played their second tournament of the season at the Gary Freeman BCU Spring Invitational at the LPGA's International Championship Course. After two rounds of play, the Owls managed a team score of 3-over-par (579) to lead Bethune Cookman by 1 stroke. Again, junior, Clint Wilhelm, led not only the Owls, but managed to put him self into first place for the entire tournament with a score of 212 (4-under-par) on the par 72 course. The team's co-captain, Justin Thompson, had an outstanding tournament as well, tying him for sixthplace with a 218 for the tournament. The Owl fell short of first place as a team, finishing third place overall in the tournament. However, the FAU Golf team is showing the fans and community that they are here to stay and will be nudging for the top spot in the next round of play starting on March 4 for the three-day South Florida Invitational in Dade City, at the Lake Jovita Country Club!